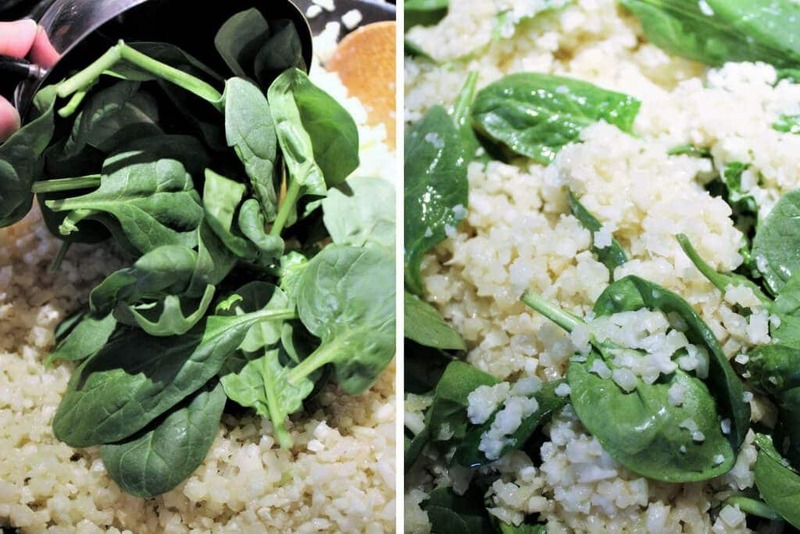 This creamy vegan cauliflower risotto with spinach will amaze you! Made with riced cauliflower and cooked to perfection, it’s dairy free, gluten free, and low in carbs and calories, yet rich. Make a creamy, delicious meal in less than 15 minutes! If you want a low carb vegan meal or side dish, this is it! My 10-year-old, Elliot, requests this all the time and we fight over seconds, so I’ve had to start making a double batch – that’s how good this is. Riced cauliflower is simply cauliflower that has been chopped into tiny pieces until it’s the size of a grain of rice. You can chop your own by putting ahead of broken up cauliflower in your food processor pulsing it over and over until it is broken up into tiny pieces. Most major grocery stores also sell bags of riced cauliflower pre-chopped and ready to cook. Is vegan cauliflower Risotto hard to make? No, this is the easiest way to make risotto. Traditional risotto is delicious, but a lot more time-consuming. This is a quick and easy dish that anyone can make with very little effort! Is there rice in cauliflower risotto? No! There is no rice in this risotto. Cauliflower is used in place of the rice for a low carb and lower calorie healthy alternative to rice. Even though cauliflower may be healthier than rice, surprisingly, I like it better than rice in this dish! How do I make vegan cauliflower risotto? Start by warming some vegan butter, or olive oil in a skillet on your lowest setting. Add some minced garlic and let the garlic warm in the oil for a few minutes. 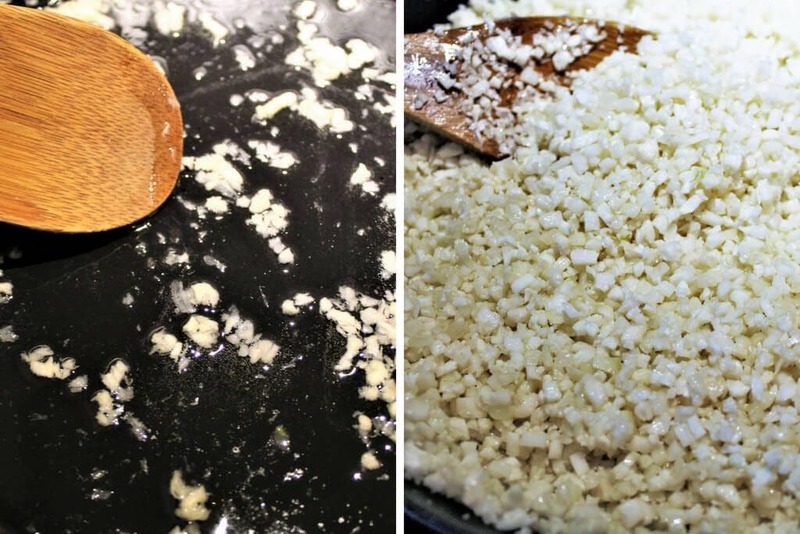 Once the butter and garlic are warm, add a bag of riced cauliflower to the skillet and sprinkle with salt. Stir to coat the cauliflower rice with the garlic butter and turn up the heat slightly. Allow the cauliflower to cook slowly stirring every minute or two until the “rice” becomes soft and slightly translucent. This will take about 8-10 minutes. Add spinach and mix well again allowing it to cook for about 2 more minutes until the spinach has wilted and become shiny. Garnish with freshly chopped parsley and pine nuts if desired and serve warm. How do you make the cauliflower rich and creamy like risotto? The trick to making this dish into a creamy risotto is cooking it slowly. Take the little extra time to allow the cauliflower to cook slowly and soak up the flavors of the vegan butter and garlic. It’s worth the wait! Want to learn how to make risotto from Arborio rice? Try this traditional vegan risotto with roasted butternut squash! Don’t forget to pin the vegan cauliflower risotto recipe for later! Easy vegan cauliflower risotto with spinach! Warm the vegan butter, or olive oil in a skillet on the lowest setting. Add some minced garlic and let the garlic warm in the oil for about 2 minutes. Allow the cauliflower to cook slowly stirring every minute or two until the “rice” becomes soft and slightly translucent. Garnish with fresh chopped parsley and pine nuts if desired and serve warm. Warm the garlic in the oil, do not allow it to brown. Cook the cauliflower slowly until it becomes soft and buttery. You can also add mushrooms to this for a great flavor. If using mushrooms, add them at them along with the garlic in the beginning. I seriously love this dish! I’ve been making it all the time lately and even my kids like it! Love that it’s low carb and gluten free too! Thanks for the recipe!